"I have lost the best years of my life. I want to get some of my life back." Emma Lacey with her pet Dougal. A twenty-three year old Co Tipperary woman's life is in shutdown due to rare brain and spinal conditions. After enduring multiple spinal operations over the last six years, Emma Lacey from Clonmel was also diagnosed with a serious brain condition in February. Emma was a ferocious competitor on the field for Moyle Rovers, a member of Clonmel Rugby Club, Hillview and Clonmel Rowing Club and an award winning Brú Ború musician but her life changed dramatically when she was just seventeen years old. She was diagnosed with a degenerative disc disease at three levels of her spine and a progressive disease called spinal stenosis. "I had a normal hectic life playing football, camogie, tennis, rugby and enjoying playing music with my friends, going to Fleadh Cheoils and teaching the tin whistle. All of that came to an abrupt end at seventeen and I have lost the best years of my life. I want to get some of my life back," said Emma who is living with chronic pain after having five spinal surgeries in the last six years. Emma was diagnosed with progressive spinal stenosis before a spinal fusion operation was carried out on two levels of her spine in October 2015. Spinal stenosis is a narrowing of the spaces within your spine, putting pressure on the nerves which normally occurs in people over sixty so the level of stenosis and how aggressive it is is very rare for her age. Following the operation Emma never walked without the assistance of two crutches and mobility gradually deteriorated further over the next few years. Eventually she was forced to drop out of her studies at NUI Galway due to her condition. In February a life of isolation, intractable pain, increasing opioid medication and disability took another devastating turn for the worst when the young Clonmel woman was diagnosed with a serious brain condition known as a chiari malformation. The condition means that her brain is too large to fit into the skull and is being pushed into her spinal canal blocking the normal flow of cerebrospinal fluid, causing excruciating pain and mobility issues. Emma underwent brain surgery last month to try and relieve pressure on her swollen brain and halt a progressive deterioration in function. 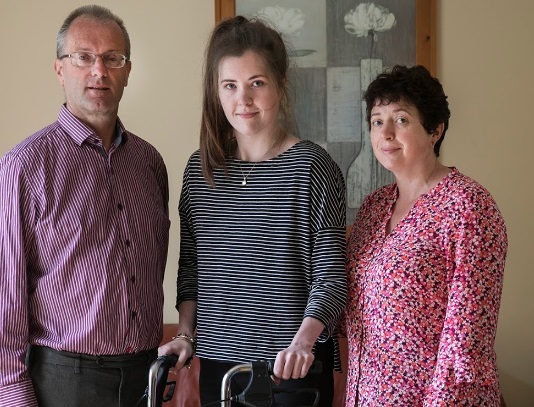 Following the surgery, Emma is also facing a sixth operation on her spine because the spinal stenosis has moved up another level in her back before she attends the National Rehabilitation Hospital in Dun Laoghaire. Friends have come together to form the Emma Lacey Trust to raise funds to support Emma and her family to provide a downstairs extension for an urgently needed bedroom and shower facility. The Trust will also provide assistance with ongoing medical costs under orthopaedic, neurosurgery and pain and management consultants and the provision of a range of professional services such as occupational therapy, physiotherapy and psychology during the long journey of rehabilitation ahead for the former Rathkeevin, Powerstown and Loreto student. The Trust is raising funds via GoFundMe and people all over the country have been donating to the fund since it was set up. A number of events are planned over the next few months including a 5k fun run/walk will be held in Powerstown Park, Clonmel on Sunday, September 16th and on Friday 28th September a gala concert will be held in Monroe at the Moyle Rovers GAA grounds in Clonmel, Co Tipperary. You can donate to the Emma Lacey GoFundMe Trust HERE and keep up to date with upcoming fundraising events can be found at the following Facebook HERE.